Yesterday, I travelled down from my flat to Gatwick airport to catch a flight to Marrakech, Morocco. You might expect, therefore, that I am writing this while sipping mint tea on the roof of a riad overlooking the bustling Moroccan markets. I am not though. I am writing this from my London flat on a grey and cold day. Due to the completely and totally unforeseeable winter circumstances - snow and cold - travel has been a complete mess here in the UK. On the weekend snow and ice had ferries, the Eurostar, trains and planes all sitting idly instead of moving people to their destinations. Yesterday, on Monday, more snow was projected later in the day, however the day started out clear but cold. I headed down to Gatwick, and things looked good. There were a few delayed flights, but nothing more than 30 minutes. About half an hour before my flight, we were called to the gate. Walking towards the gate along a high elevated walkway, I could see that the clear, cold morning was turning into a wet, icy afternoon. My flight was scheduled to take off at 3:30. 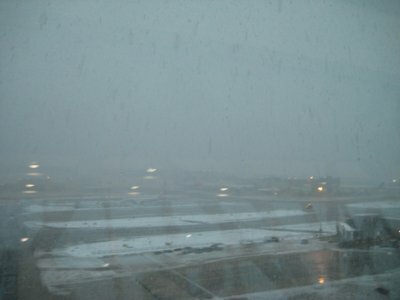 Just after 3:00, Gatwick closed its runway. The runway stayed closed for the next 4 plus hours. I watched the departures board. All it would tell me is "Marrakech - Please Wait," just like most of the rest of the flights. Between 6:00 and 7:00, BA cancelled all their flights that had been scheduled before 7:00 PM. EasyJet held off cancelling, keeping us all to "please wait." 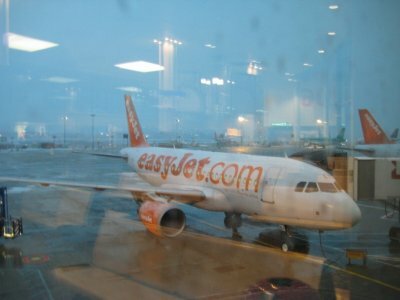 Around 7:00, the first few easyJet flights started to be cancelled. At about 7:30, my flight was cancelled. So was every other easyJet flight on the board. The airline information desk became a mad house. I, the smart traveller, decided to skip the queue and go online. I went to the easyJet site and looked to switch my flight. There was nothing for the 22nd or 23rd of December. There was an early flight on the 24th of December. This is where I made a mistake. I should have booked it, but I didn't. It was three days away, which seemed so far away, and would cut my vacation down to 6 days instead of 9 days. I think I was still in disbelief that it was happening, I think. Instead I left the airport and went back home (on delayed trains). As I stood on the platform at Gatwick's train station, British Airway flights started taking off above me, the runway obviously finally re-opened. On the train ride home I let the seven hour delay and finally cancellation sink in and situation become real. Once home, I went to rebook, but it was too late. Even the 24th wasn't available now. Nothing until after Christmas. Accepting those flights would turn a 9 day vacation into a 2 or 3 day vacation. Not really worth it, I felt. So instead, I asked for a refund. Now it looks like I might spend Christmas here in London. Due to all the travel disruption over the past 4 days, there is an awful backlog of travellers trying to get some place. I may try to book something else, but I'm afraid that the airports and train stations will be chaotic places with too many people trying to get onto too few travel options. Such is travel at winter. Sometimes you just can't get away. Such a bummer, Greg. This weather has left no European travel untouched, it would seem. Hope you can rebook after the holidays? Back to work after the holidays, so Morocco will have to wait for some other time. I am thinking that I might book a weekend away - even if it is London, just so I can have some sort of time away from home.